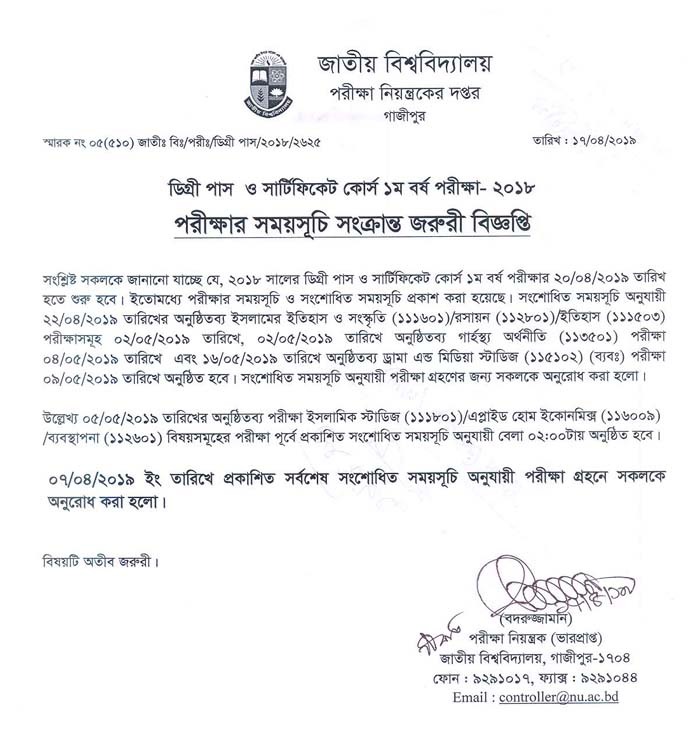 National University of Bangladesh Gazipur office announces Degree pass and Certificate course 1st year exam routine today. The title is NU Degree 1st year exam routine. If you are a Student of Nu Degree academic. Then Read Full The Educational Notice. 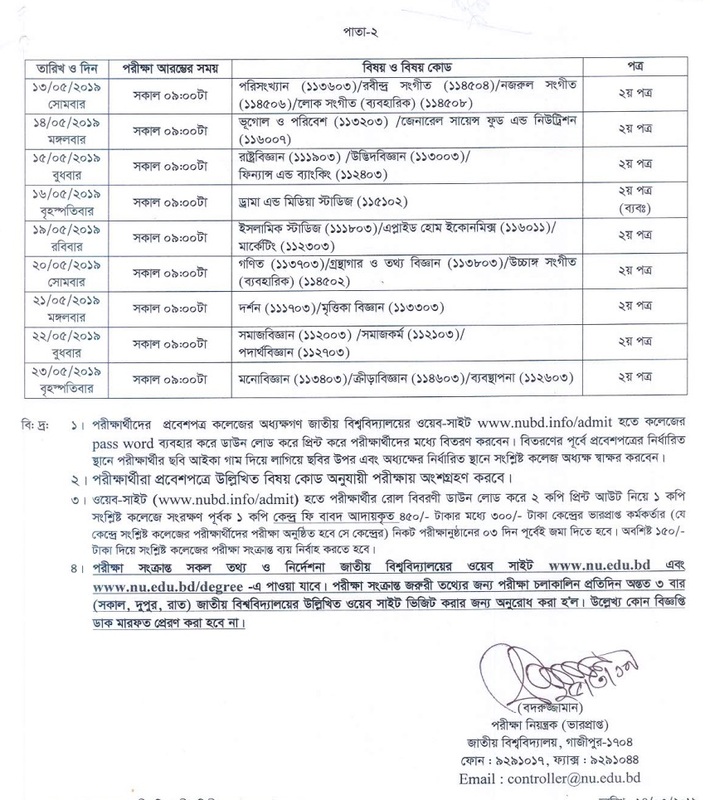 According to Recent NU Notice, 2018 Academic Degree pass and Certificate course first year Exam Will Start on 24 April 2019. The Nu Examination will continue on 23 May 2019. Any student can get a full degree routine from nu official website nu.ac.bd or nubd.info. Yet If you did not Visit the Site to download degree exam timetable, Then Student can Download Degree routine 2019 1st year pdf from edujobbd.com. Here Also Available Degree Exam result, Degree Admit card and Others many information. Check the similar notice below. 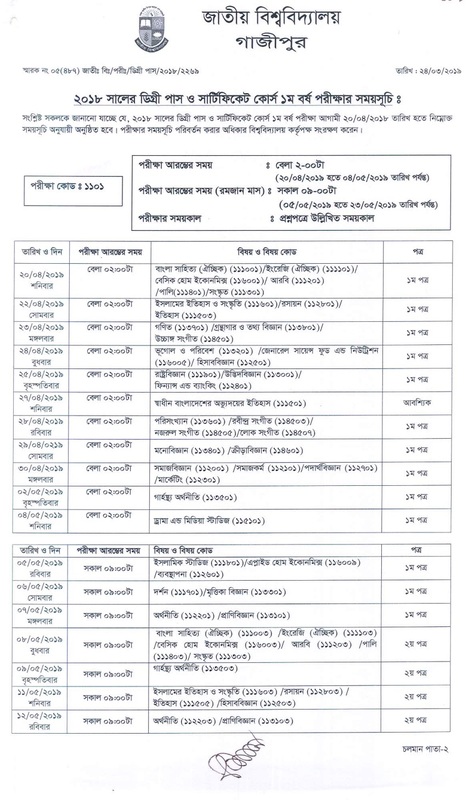 As you know The National university authority already publishes The degree 1st year exam routine 2019. below I will upload the Recent nu routine related notice. Above you see the The Degree routine 2019. if you don’t download the upcoming exam plan. Then See the table. which made by nu admin. If you finished to Download the Routine of Degree pass course. Then you should fully prepare for the written examination. you must know If a student has not any preparation for the event. She/He will fail or Cancel on Degree 1st year result. Just take time to Academic book reading and Revising. Don’t Forget to download Degree Exam Admit card from College Official Website. you will also get the Exam center address by any Classmate or Teacher. so don’t be tense and Be Attention on your Degree All Subject Examination. As any Other National University Recent Notices will your mobile and computer screen. just follow our Facebook page, Pinterest, Twitter, Linkedin,and Google+ for more details information.